Fret not thyself because of evildoers, neither be thou envious against the workers of iniquity. For they shall soon, be cut down like the grass, and wither as the green herb. Wow! If we would only follow this advice and not fear those out there in the world that practice evil. All too often we fret and worry, and ask ourselves, "What's this world coming to?" We worry about the economy, layoffs, the war, terrorism, the price of gas, the rising cost of food, how we are going to meet our bills...you name it, we worry about it. Yet the Bible tells us not to worry but to trust. So He assures us we will be fed, and dwell in the land, if we trust in Him. Why do we humans find it so hard to trust in the Lord? He keeps His word,...He never breaks His promises! He is always faithful,...and He loves us! So why do we continue to fret? Psalm 37 was my mom's favorite Psalm. She raised 4 kids with no help from a husband most of the time, and she only had one arm after losing her right arm in a car accident. She had very little money to live on , yet she faithfully attended church, and saw to it that we kids always went with her. She taught us to pray and to trust in God. 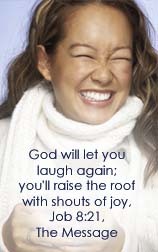 And not only that,...but she delighted in the Lord! Her desire was to raise us to love the Lord. She dedicated us to the Lord, and she was committed to live what she believed in front of us. I never doubted that she loved the Lord,..and even as a child I wanted to know the God she loved and serve the God she served. Commit thy way unto the Lord, trust also in Him; and He shall bring it to pass. So many times I saw how God provided for our needs. So much in fact, that I hardly realised that we were poor. We always had what we needed. And above that, we often had even what we wanted. I saw my mom rest in Him, and she gave us a sense of well being, because she wasn't worried all of the time about how she was going to get by. Mom had joy in her life. She sang a lot, and smiled, and enjoyed her life. ...The meek shall inherit the earth; and shall delight themselves in the abundance of peace. Mom was a gentle woman and she did have peace in her life. Like all of us she had times when she failed, or lost her temper, but it wasn't her usual routine to worry, or to get mad, or to lose her temper. It was her habit to pray about everything. 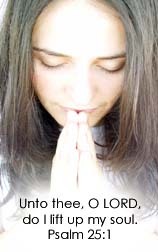 Many times when I was a little girl, she would ask me to get on my knees and join her in prayer. And a lot of those times we were praying for other people's needs. Isn't it great to know that the Lord holds our hand, and even when we fall He pulls us back up, because He has a tight hold on our hand? Just the same way that we hold our little children's hands,..and we hold tight to them and pull them up when they start to fall. We love our children,... and He loves us! The Lord shall help them, and deliver them from the wicked, and save them, because they trust in Him. Of course there is much, much more to this beautiful Psalm. I just picked out a few of the verses that spoke to me today, and those that brought back fond memories of my mom today. At one time she and I memorized this Psalm and quoted it together many times. Much of this Psalm speaks of our enemies, and evil doers, and there is lots of evil out there in our world today. I would just remind us to not fret and worry,...to trust in Him, to commit our way to Him, to rest in Him and wait patiently. Staying in the word is a good way to feel secure. Why not join us today for Tuesdays Together In The Word! Yes, my mother was very special. She died when she was 71. There is hardly a day that goes by that I don't think of her,...and remember a special memory. Nobody is perfect, and that's for sure! But I choose to dwell on the positive things and in my mom's case there was plenty of positive! She had plenty of hard times in her life, and she had health issues in later years,.... after I was grown, and she spent many years in a nursing home. That was sad, and hard for me to see that happen to her. But the fact that she is in heaven now and suffering no more, is a great comfort to me. And of course I look forward to seeing her again and spending eternity with her. Yes, Abigail was here for the weekend and we sure enjoyed her. She had a violin recital that we went to on Sat. morning and then she came home with us. We went shopping and then she went to her friend's 16th birthday party that evening. Five girls dressed up and went out to eat at a nice restaurant together. They had tons of fun. She went to church with us Sunday morning and evening, and then she stayed for a youth activity Sunday night. She has friends at our church that she enjoys seeing. Monday she had devotions with us and we had some great conversations. Then later she helped us with some computer issues. She and I went for a nice walk, and then it was time to meet her dad at violin lessons and we left her there and he took her home. It all worked out great. She is such a wonderful girl. So fun, yet so mature for her age. Well, I guess I had better go. I'm so glad you had such a great time with Abigail! She's really a special person. It's amazing that I am twice her age, yet she is so wise and I admire her talents so much. My Mom was the same way...she was not perfect, but her heart was beautiful and that's what I will always remember. I am trying to take the things that she struggled with (anxiety, health issues) and make sure to learn from her and not worry like she did. When her Mom died, it about killed her with grief. I promised myself I would not let her death affect me that way, and I know she would be proud of the conscious effort I am making not to make those same mistakes. She always believed my faith was stronger than I ever realized, and when I read things she wrote, telling me that I have strong faith, I know it's because she taught me to lean on and love the Lord. One day we will all see each other again and I know that is going to be a day of rejoicing!! I read in a book that when you get to Heaven, all of the people who influenced you in your walk with Christ will be there to greet you. I know that you and your entire family have influenced me, and that is exciting to think that one day in Heaven, we can all hang out! Do you think they have blogging in Heaven? LOL!! What a wonderful post! I loved reading about your mom, she sounds like she was a lovely woman inside and out. I no longer have my parents, both have passed on. I think about my mom almost everyday as well. Thanks for stopping by my page and leaving an encourageing note. Beautiful post Linda...Thanks for sharing it with us.. This Psalm really spoke and ministered to me as well, and I love the insights you have shared! Great truths found here! Don't you just love the Psalms? Wow -what a beautiful tribute to your mother. Your post really encouraged and inspired me in my walk with the Lord and my own children. Thank you for sharing. I am so glad to have you join Tuesday Together in the Word. I look forward to reading more!